Hey Everyone! I'm so excited to share with you guys some of my ultimate skin care must haves. 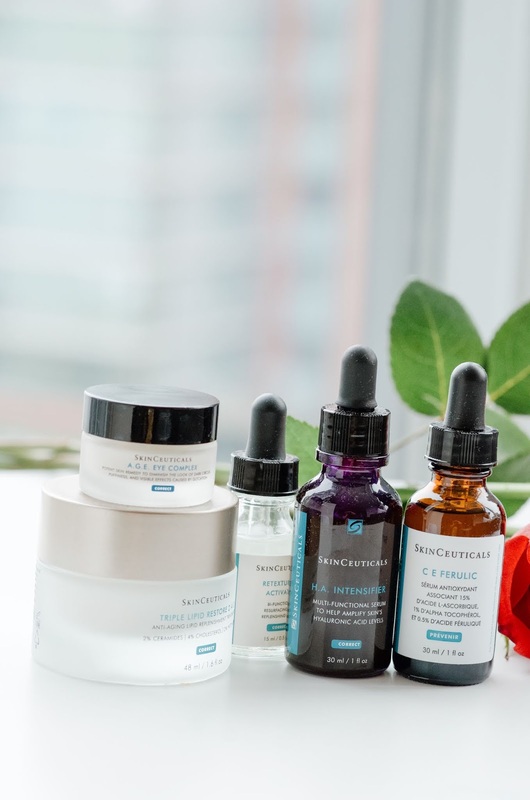 I've been using SkinCeuticals via BeautySense regularly since my pregnancy with Harrison and it has been a game changer for me. My skin is naturally very sensitive so it's been amazing to find products that work and that don't cause irritation. The best part is that all of these products are safe to use during pregnancy and also during nursing. This is incredibly important to me as I have been either pregnant or nursing for nearly 4 years! 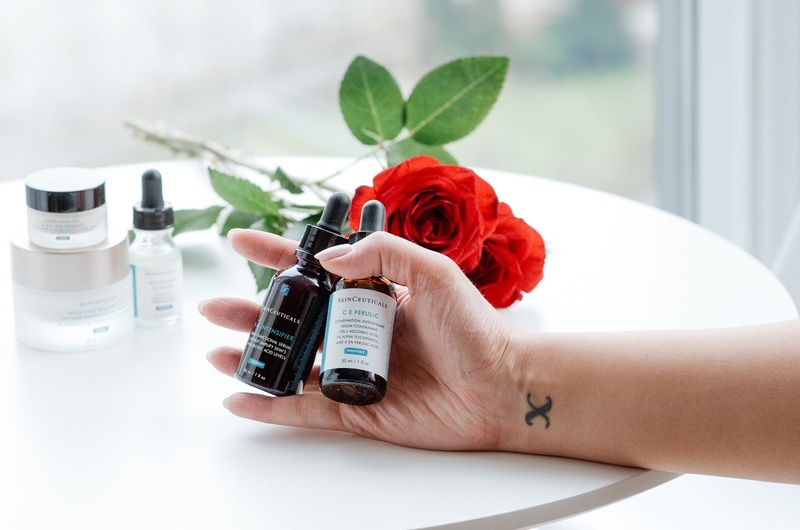 I want to make sure that my skin looks and feels as young as possible, without any form of retinols or cosmetic injectables, as they are not safe during pregnancy or nursing. 1. I love this cleaner, the LHA Cleansing Gel. It's so amazing and leaves my skin feeling super clean and tingly, but not tight and dry. I also love that it's both an anti-aging and blemish fighting cleanser, as I do sometimes have blemish-prone skin, especially in the beginning of my pregnancies - and right after I deliver. This cleanser is great for combating hormonal changes that can cause breakouts, but doesn't over-dry your skin. 2. 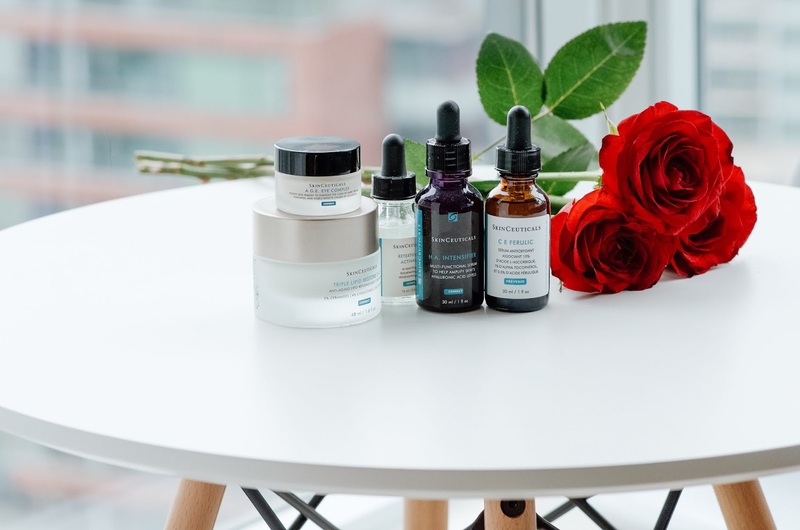 This serum, the C E Ferulic, is the holy grail of all serums. I use it daily, in the morning. It contains vitamin c and e, as well as l-ascorbic acid. All of which are powerful anti-aging ingredients. And, I have noticed a major difference in my skin since using this daily. Especially in the one frown line I have in-between my brows. Amazingly, it's become a lot less visible! 3. I just started using this serum, the H.A Intensifier recently and it has really helped with plumping and also eliminating fine lines. I use this in the morning and at night. This serum helps aid the skin in building hyaluronic acid levels - which is what gives our skin a youthful 'plump' appearance. 4. This is by far my favourite moisturizer of all time: the Triple Lipid Restore 2:4:2. Especially during the dry winter months and during my pregnancies, as I have extremely dry skin. It contains even more anti-aging ingredients and also helps my skin look soft, youthful and dewy. 5. Lastly my eye cream, the A.G.E Eye Complex - it's the best anti-aging eye cream, and it's also great underneath makeup. It helps to eliminate dark circles, and fine lines. I've noticed a really big difference in my dark circles, which is an issue I have struggled with for years. It's also something that this tired mama needs! The opinions, text and images are all mine.